Beautifully located just north of Branson and only 20 minutes south of Springfield, the National Tiger Sanctuary is one of the most visited Branson attractions that offers exceptionally unique experience for visitors. This tiger sanctuary is in a safe and protected environment where you see an array of critters including tigers, panthers, lions, and mountain lions, and many more. There are different kinds of guided tours offered at the National Tiger Sanctuary which include Awareness Tour, the Feeding Tour, the Behind-the-Scenes Tour and the You Feed Tour that allows you to get unbelievably close to the majestic cats. The tours give you the opportunity to witness the big cats sleep together, nurture their young, play with pumpkins and barrels, and eat the food as they rip through bones. Each tour allows you to explore the sanctuary as your guide leads you from habitat to habitat, introducing you to each amazing creature. You’ll get to learn many things about the lions and tigers such as what they eat, where they came from and how they interact with the staff. There is even a tour that allows you to sit in the feeding process and watch as the cats use their powerful teeth to easily chomp through bones. This fascinating Branson attraction provides visitors a fun-filled experience that is also incredibly interesting and educational. You may have seen the big cats on the Discovery Channel but seeing them up close and personal is entirely different. You’re bound to leave this Branson attraction with a whole new perspective on wild cats. Step over into the wild world of lions and tigers with a guided tour you choose. Take as many pictures as you want and bring home the memories you and your family have enjoyed during your visit. Many of the tours offered at the National Tiger Sanctuary are available until December 31, 2016. The Awareness Tour gives you the opportunity to visit the big cats and see each other of their unique personalities. 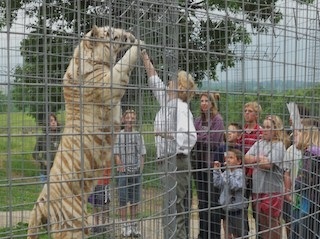 This tour strives to show you big cat knowledge and appreciation before you leave the Sanctuary. With the Feeding Tour, you’ll get to enjoy everything that is included in the Awareness Tour, with the chance to visit the big cats, learn about their personalities, and gain knowledge about them. Behind-the-Scenes Tour is another tour offered at the Sanctuary where you’ll get to experience firsthand and the way the big cats are cared for and fed. You’ll even get to feed them. See how their food is prepared, assist in the feeding process, and watch them as they rip their food. The You Feed Tour at the Sanctuary gives you the chance to experience the feeding process yourself. The National Tiger Sanctuary offers you a once-in-a-lifetime experience to feed the big cats and watch as they eat. The National Tiger Sanctuary is a beautiful Branson attraction where you can have the opportunity to see several and interact with the big cats.